University of Arkansas Mathematics Professor Chaim Goodman-Strauss and KUAF 91.3 FM Radio Journalist Kyle Kellams have been mathematically entertaining children all over the world for nearly forty years. In January 2004, Kyle and Chaim started broadcasting a weekly mathradio segment on Kyle’s Sunday Ozarks at Large radio show. The Mathfactor CD, a collection of the very finest of the mathfactor segments that appeared in late-summer 2004, was printed in October of that year. In 2005, we started podcasting, to great acclaim. Today, the Math Factor extends its reach into tens of billions of homes in over 320 countries worldwide. If you like what you hear, please tell some friends! You can even download this nifty poster to share! 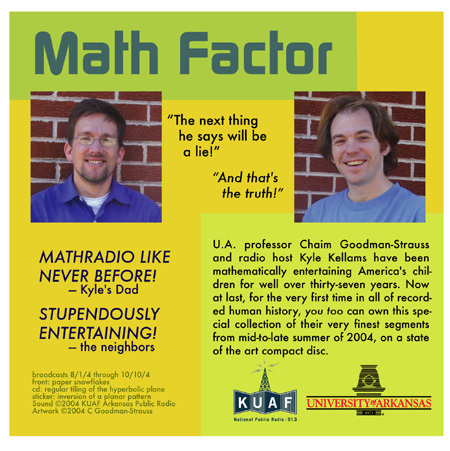 Here is the back of our Math Factor CD; Kyle is on the left, Chaim is on the right. Jeff works helping to manage technology companies in Southern California. When not engaged in such cat herding, he spends much of this time listening to old Math Factor episodes over and over again. Tenacious submission of puzzle ideas by email eventually lead to his posting them here directly. If you have the chops and want to join in, drop us a sample post! We’re always interested in new authors coming on board!